A scene from the Paterson Strike Pageant, held June 7, 1913 at Madison Square Garden, New York City. The pageant was staged to raise awareness of and funds for the workers involved in the 5-month long Paterson Silk Strike. 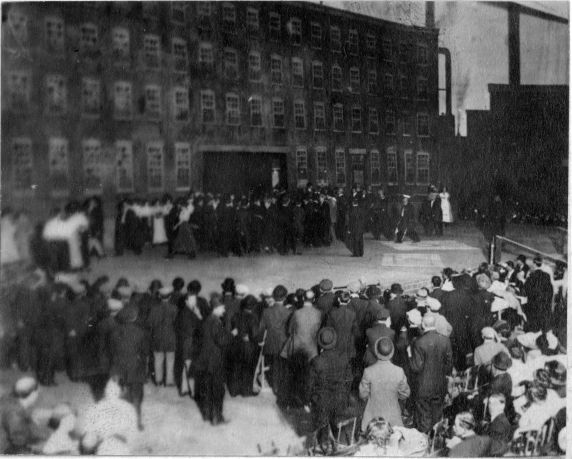 Envisioned by John Reed, it used a thousand of the strikers as actors and featured a ninety-foot backdrop of the Paterson silk mills painted by John Sloan. As an artistic embodiment of the Industrial Workers of the World’s (I.W.W.) battle between the working class and capitalism, the pageant was a success, however as a fundraising effort it ultimately failed.